Paul Tremblay's Disappearance At Devil's Rock is one of my favourite recent horror novels and I also really enjoyed A Head Full of Ghosts so I had high hopes for The Cabin At The End Of The World. It begins with a pleasant, believable couple, Eric and Andrew, taking a summer holiday to a remote cabin with their seven-year-old daughter Wen, adopted from China as a baby. Wen is playing outside when a stranger who introduces himself as Leonard arrives and strikes up a conversation with her. Like all sensible children, Wen knows she mustn't talk to strangers, but Leonard somehow seems different and she gradually starts to trust him. But then Leonard is joined by three others, and all of them are carrying strange, homemade weapons. "None of what's going to happen," Leonard tells Wen, "is your fault." What happens is that the four strangers break into the cabin and hold the family captive, subjecting them to a terrifying ordeal. But this isn't a standard 'home invasion' horror plot and the intruders aren't robbers, or gay-bashers, or racists. Instead, they insist that they've experienced shared apocalyptic visions and that Eric, Andrew and Wen have been chosen to save the world - but that they can only do so by making an appalling sacrifice. 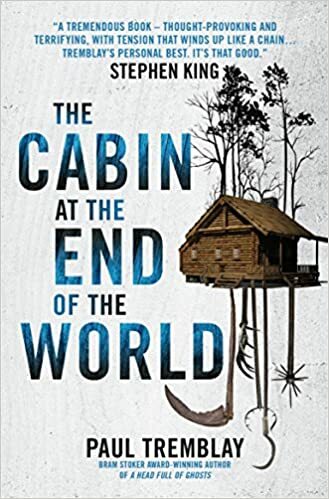 Like the other books by Tremblay that I've read, The Cabin At The End Of The World has an oppressive, claustrophobic sense of oddness about it, and offers very few answers to the questions it raises. Are the four strangers simply suffering some sort of collective delusion? Are they just playing a sick, sadistic game? Or are they speaking an unthinkably terrible truth? There are hints in the text about who Leonard, Redmond, Sabrina and Adriane might be, but equally, it might simply be who they believe themselves to be. Previously unknown to each other, they've met online while sharing their strange visions, and have come to a mutual conviction that they can use a family to prevent the world from ending. In some ways, this seems outlandish, but spending any time in certain types of online environment will reveal people who can be quickly convinced that all sorts of strange and dangerous beliefs might be true. Eric and Andrew perceive the four strangers and their actions somewhat differently, with Eric seeing swarms of flies and mysterious shapes that Andrew does not. Is this down to Eric suffering from concussion after the couple's attempts to stop the break-in? Why does Andrew become gradually convinced that Redmond is the homophobe who once attacked him in a bar, while Eric doesn't think he's the same man? I found this book frightening to a degree, but primarily because the basic premise is a nightmarish one; there were no specific moments that stood out for me as being especially memorable or tense, and I do think it drags somewhat in the middle. The overall concept is strong and original, but I don't there's quite enough there to sustain a novel of this length without starting to feel a little repetitive. Wen, Eric and Andrew are well-drawn, and we get enough of their backstory to get a strong sense of them as a family unit and to feel their predicament deeply, but despite the peril they're in, I found this book didn't hold my attention quite as much as it should have done. I love the ambiguity of it, it raises some fascinating ideas, and it's certainly an interesting read, but not necessarily a compelling one.